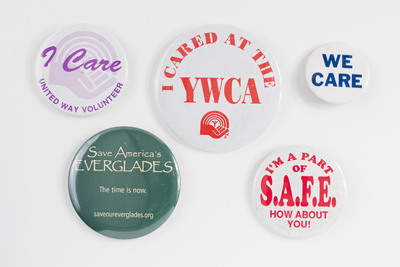 I Care United Way Volunteer button. cared at the YMCA button. WE CARE, white with blue lettering button. Save America’s EVERGLADES The time is now. saveoureverglades.org button. I’m a Part of S.A.F.E. How About You!, S.A.F.E. Pet Rescue, Inc. in St. Augustine and Northeast Florida Button.